A natural antioxidant source, Oil of Oregano contains phytochemicals which support the body’s natural resistance. 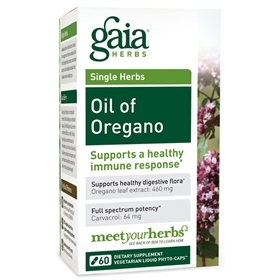 Gaia Herbs’ supercritical CO2 extract of Oregano volatile oils contains phenols, including Carvacrol and Thymol. These oils help support a healthy microbial environment in the intestines and a healthy immune response. Adults take 1 capsule 2 times daily between meals. Suggested maximum time of use 2-4 weeks or as recommended by your health care practitioner.